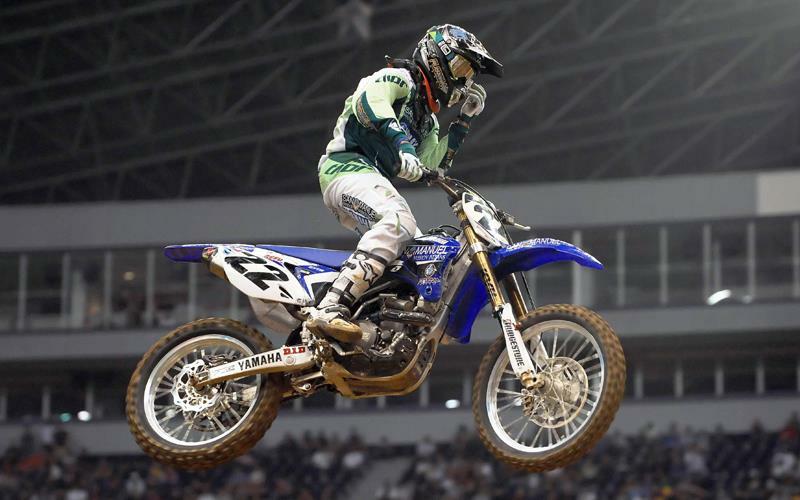 Chad Reed consolidated his lead in the AMA Supercross championship with victory in Texas, the Australian doing just exactly as much as he needed to to take the win barely two seconds ahead of the chasing pack. The pack consisted of Josh Hill, Davi Millsaps and Kevin Windham. Hill and Millsaps made second and third early on, past the fast-starting Travis Preston, but Kevin Windham gave himself a bit to do, with only an average start. But Windham was up to the challenge with the championship at stake, and made his way back on to Millsaps’s tail, as Davi battled Hill. The two youngsters battled, colliding in mid-air at one point, Windham pushed, Windham probed, Windham rode on the edge and went to the limit, but he just could not find a way past Millsaps on the slick dirt. Reed made seven points on Windham on Saturday and now with four rounds left, Reed has 27 points in hand. But where Chad Reed cruised home, doing what he had to, for the first time this year Villopoto came out and just mauled the competition. It took him two laps to get into the lead, but then he dropped the hammer and put a quick ten seconds on the competition. By contrast, series leader Trey Canard had a horrible night, but put in an awesome performance. The Torco Fuels Honda rookie had a crash on lap one that saw him cross the line in 20th place, but the youngster refused to give up and staged an excellent fight back to take fourth on a night when the more established stars struggled to make passes stick. Between the two, Josh Grant had a great night to take second ahead of Martin Davalos.